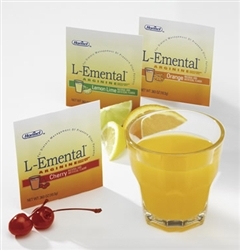 L-Emental® Arginine Drink Mix Supplements are designed to assist wound healing by delivering arginine, antioxidants, and zinc. Arginine is an amino acid that is high in nitrogen and has been associated with improved nitrogen balance and wound healing. Although produced by the body, arginine may become conditionally essential during times of metabolic stress. L-Emental® is available in cherry, orange and unflavored. Mix contents of packet with 6-8 ounces of cold water or juice. Chill until ready to serve. 1. ADD 1 PACKET OF POWDER TO 250 mL OF WARM WATER IN A CONTAINER. 2. COVER AND SHAKE FOR 30 SECONDS. UNDISOLVED PARTICLES WILL DISPERSE AFTER STANDING A FEW MINUTES. TUBE FEEDING: ADMINISTER AT ROOM TEMPERATURE AR RATE SUGGESTED BY HEALTHCARE PROFESSIONAL. USES 5 Fr TUBE OR LARGER. ORAL FEEDING: FLAVOR. CHILL OR SERVE WITH ICE. DRINK SLOWLY. L-Arginine, Tartaric Acid, Natural and Artificial Flavor, Maltodextrin, Malic Acid, Ascorbic Acid (Vitamin C), Zinc Gluconate, D,L Alpha Tocopheryl Acetate (Vitamin E), Sucralose, Red 40. L-ARGININE, TARTARIC ACID, NATURAL AND ARTIFICIAL FLAVOR, MALTODEXTRIN, MALIC ACID, ASCORBIC ACID (VITAMIN C), ZINC GLUCONATE, D,L ALPHA TOCOPHERYL ACETATE (VITAMIN E), SUCRALOSE, YELLOW 5, BLUE 1. L-ARGININE, TARTARIC ACID, MALTODEXTRIN, NATURAL AND ARTIFICIAL FLAVOR, MALIC ACID, ASCORBIC ACID (VITAMIN C), ZINC GLUCONATE, D,L ALPHA TOCOPHERYL ACETATE (VITAMIN E), SUCRALOSE, YELLOW 5, YELLOW 6. Maltodextrin, Modified Starch, L-Leucine, L-Glutamine, L-Arginine Acetate, Magnesium Gluconate, L-Valine, L-Isoleucine, Calcium Glycerophosphate, Safflower Oil, L-Lysine Acetate, L-Aspartic Acid, L-Alanine, L-Phenylalanine, L-Proline, Glycine, L-Threonine, L-Methionine, Sodium Glycerophosphate, L-Histidine Monohydrochloride Monohydrate, L-Serine, Potassium, Chloride, Potassium Citrate Monohydrate, L-Tryptophan, Sodium Citrate Dihydrate, PotassiumSorbate, L-Tyrosine, Choline Bitartrate, Ascorbic Acid, Ferrous Gluconate, Polyoxyethylene Sorbitan Monooleate, Zinc Sulfate, Alpha -Tocopherol Acetate, Niacinamide, Calcium Pantothenate, Ascorbyl Palmitate, Managanese Glycerophosphate, Riboflavin Phosphate (SoidumSalt), Vitamin A Palmitate, Cupric Citrate, Pyridoxine Hydrochloride, Thiamon Hydrochloride, Folic Acid, Biotin, Sodium Selenite Anhydrous, Sodium Molybdate, Potassium Iodide, Phytonadione (Vitamin K1), Chromic Acetate, Vitamin B12, Vitamion D3. Best product to deal with surgery wounds and, in my case as a quadriplegic, skin ulcer wounds. Recommended by hospital nutritionist/dietitian.